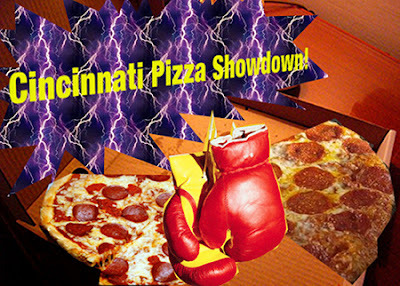 It’s been awhile since we did a pizza showdown post. We got wind of Ramundo’s pizza challenge a few months ago. 2 people. 10 minutes. 1 24 inch New York style pizza. If you meet the challenge terms, you don’t have to pay for the pizza. The record time is 3 minutes and 14 seconds. Don’t ask me how they did it. I don't think they were human. David searched for a partner to complete this challenge, and found one in Jason, the publisher for Eastsider Magazine. You can read his account of the event here. I was not too pleased with the idea of this challenge. I pictured David eating a ton of pizza, then coming home and laying on the futon, rubbing his stomach, moaning and calling for me to fetch him Perrier. But marriage is full of compromises. David pointed out he didn't stop me when I ordered and attempted to finish the Hawaiian volcano drink at Oriental Wok (usually meant for two, I failed). I bought some Perrier in advance. “I can put away food like nobody’s business. We can take this thing down.” Jason assured us. Ramundo’s is a smaller pizza shop, located in Mt. Lookout. They serve New York style pizza, and they were doing quite a bit of business while David and Jason were stuffing their faces with pizza. you'll get em next time, honey. David ate his half and some of Jason's, but the chewy pizza was Jason's undoing and we didn't meet the challenge. Oh well. There's always next time. How was the pizza? Pretty good. Not too much sauce, a good amount of cheese, not too much garlic. I think it is a pretty good example of New York style pizza. It came close to the best we've had in Cincinnati, Fratelli's in West Chester. Liz from GIMB put together a nice post with some more pictures of Ramundos if you want some more pizza action. She points out that you can buy pizza buy the slice, which is an option I like a lot. 0_0 man thats a big pizza, it looks like they were close? Can't even wrap my head around you not finishing a drink, I didn't think there was anything you couldn't do once you made up your mind. Sigh, I could do this SOLO! But, I could not eat again for a week after or I would gain a ton.